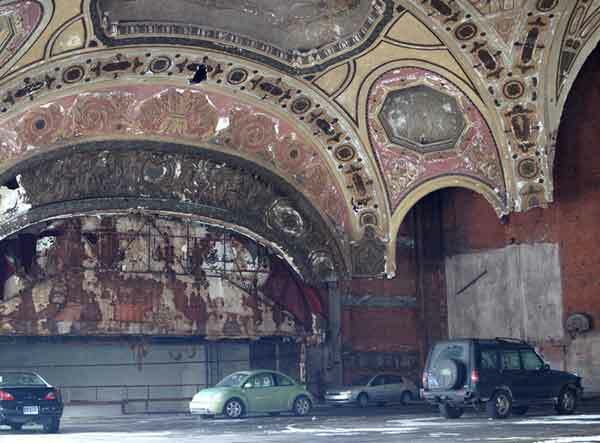 Detroit, known as Motor City, once the fourth largest city in the USA, home of the Ford, General Motors and other major car manufacturers, is nowadays a city in serious decline, having lost more than half its population and much of its real estate. Until recently, residents would celebrate ‘Devil’s Night’ on the eve of Halloween by going out and setting fire to dilapidated buildings. Houses, factories, stores, office blocks, theatres, even the railway station, stand in ruins or have disappeared altogether, leaving vast empty lots that have returned to nature. Home of Motown music, Detroit is also the most segregated major city in the USA and one of the poorest, struggling to provide public services for its needy inhabitants. With the participation of Detroit artist Tyree Guyton, French sociologist Loïc Wacquant, Detroit-born writer Dan Georgakas, Detroit photographer Lowell Boileau, and a variety of local residents, the film looks back over the history of the city in the twentieth century: over the rise and fall of the social system identified by social theorists as ‘Fordism’; the way the city was shaped by the automobile; and its decline following the deindustrialisation which began in the 1950s, leaving it ill-adapted to the post-Fordist society of the epoch of globalisation.Much of the story is told through a rich variety of archive footage – of the Ford plants, mass protests of the Depression years, Diego Rivera painting his famous mural ‘Detroit Industry’, the struggle for trade union rights, the riots of 1943 and 1967 – through which the film charts the battle over the image of the city and its industry that began when the Ford Motor Company started making its own films back in 1913.